Beans and cornbread. Buckwheat cakes. Black coffee. There are so many foods that are our favorites because of nostalgia — maybe more so than flavor. Sure, these foods taste good. But what really makes them special is that they remind you of your grandmother, or your first date with your spouse, or childhood lunches. Take, for me, Exhibit A: The Peanut Butter Crisscross Cookie. What is this you may ask? 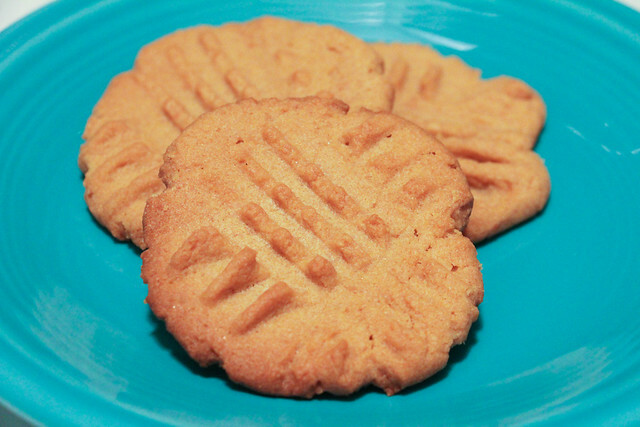 Well, it’s a simple peanut butter cookie made with just a handful of ingredients and topped with a fun crisscross pattern made with a fork. Simple. Easy. And definitive of my childhood years. I’ve never been talented in the kitchen. I’m a great eater, not so much a cook. But this simple recipe was something even I could follow as a child — and continue to make well into my adult years. I would grab a chair from the dining room and prop it next to our refrigerator. In the cabinets above the refrigerator was a treasure trove of recipe books, cards and magazine clippings. I would thumb through them until I found the recipe card for my beloved peanut butter crisscross cookie. I would gather the handful of ingredients we would always have on hand: peanut butter, eggs, sugar, baking soda. Mix them up. And then my favorite part: I would take a fork, dunk it in the flour container and squash the cookies with the back of my utensil — longways, then sideways. And, finally, I’d wait the excruciating 8 to 10 minutes until they were baked golden-brown. This treat was so special for a few reasons: I could actually make it all on my own and I was able to make it with the ingredients we had available. That concept, even at a young age, was so fun to me. One of the things I most value about Appalachian food culture is the inventiveness and ingenuity of people who worked within the means of what they had available to create rich, delicious meals that were rooted in their culture. Peanut butter cookies, of course, are not that. But what they have demonstrated to me, in a small way, is that quality of resourcefulness. And, I gather that many of the dishes we hold near and dear to our hearts were built upon the same concept. Many of those nostalgic favorites were likely based on foods that could withstand harsh seasons and mountain conditions. They were foods that were plentiful in our region, and thus became meals we associate with our childhoods or special occasions. Eating a fresh-baked peanut butter cookie that I lovingly and painstakingly created all on my own is one of those foods for me. Dipped in a glass of ice-cold milk, that cookie is more than just a cookie: It’s a look inside my childhood and my values.